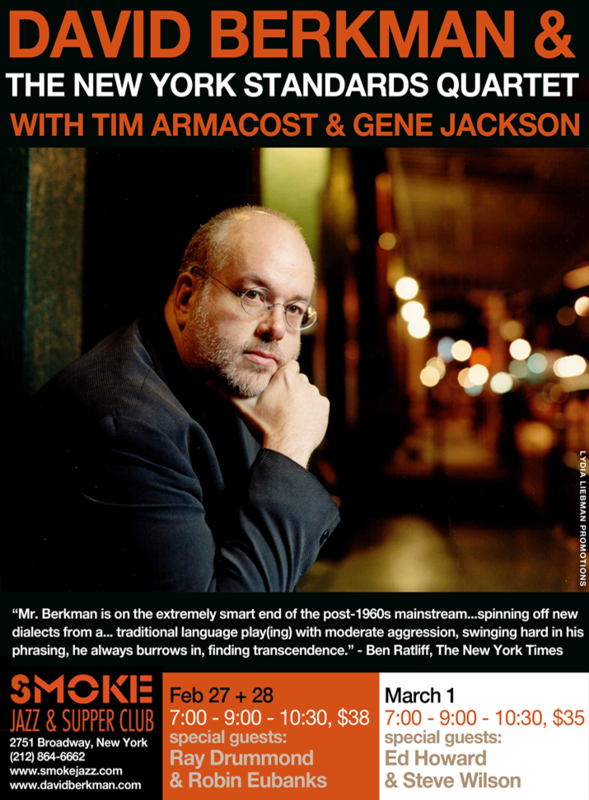 We are thrilled to announce the debut of the New York Standard Quartet (David Berkman, piano, Tim Armacost, saxes and Gene Jackson drums) at SMOKE JAZZ CLUB, February 27, 28th–with Special Guests Ray Drummond bass and Robin Eubanks, trombone) and March 1st (with Special Guests Steve Wilson sax and Ed Howard bass). It’s a 3-day weekend spectacular at Smoke. Smoke is one of New York’s best jazz clubs, a beautiful intimate atmosphere to hear some of the today’s top jazz groups with excellent food. Should be a great weekend and I hope you can be there with us.